"I'm a bit too pop for the punk kids, but I'm too punk for the pop kids". The opening lines of 'Stories for Monday' sums up the tone of the album entirely, proving that this band know what sort of music they want to make, and are unapologetic about straddling genres and making themselves difficult to classify. Which is fair enough - most of us don't want to be defined by labels, so why should their musical style be any different? 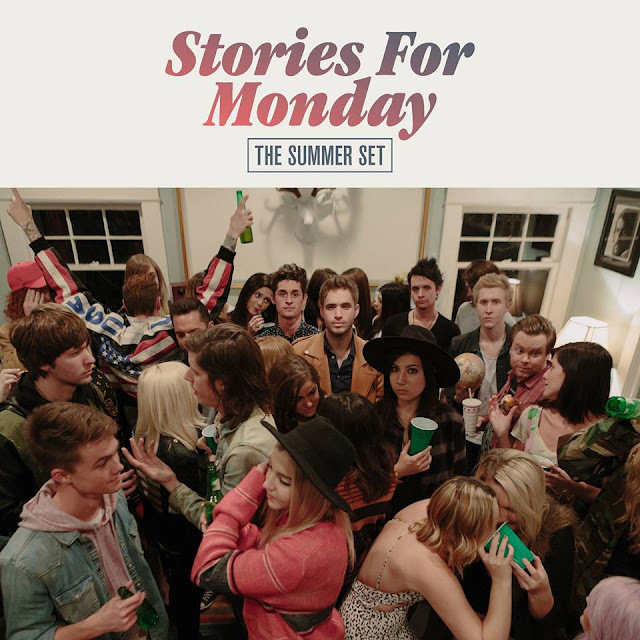 Despite almost breaking up last year, The Summer Set have returned with their fourth studio album, 'Stories for Monday'. This record is a collection of fun tunes, very much in the pop-punk vein, if we have to classify, and are very easy to get stuck in your head! I feel that the band is aptly named, as their music is the soundtrack to youthful summers, conjuring up images of sunshine on the beach, driving with the windows down, and staying out all night, just because you can. So much of the album is full of energy, of dance-y pop tunes, with just enough punk thrown in there This is broken up by slower tracks too, such as "Change Your Mind" and "Wonder Years", but every track is still big, full of emotion and sentiment, with hardly a filler track to be found. Even when the lyrics take a more serious theme, the overall tone remains fun and upbeat - though admittedly, there are moments when things get a little too pop for my usual taste! But sometimes you just want to listen to something light and catchy, and this album is full of summery, feel-good tunes to sing along to. Lyrically, there are several tracks on the album which feel preoccupied with age and growing up, expressing sentiments that I'd imagine many of their listeners will relate to. "The Night is Young" is a stark reminder to live in the moment, and not dwell in the past, while "When the Party Ends" fully accepts that everyone has to grow up, but wants to enjoy youth while it lasts. There's a spirit of party to these songs, but a realistic one, that accepts the truth behind it, that everyone grows up eventually, and yes, the party ends. There is a personal truthfulness ringing in the lyrics too, as once you take into account the band's near-split, some tracks become quite revealing. The opening track, "Figure Me Out" speaks of feelings of confusion and uncertainty about one's identity, most likely expressing what was being felt around the time of the near-split. Then the complete reverse appears in "All In", where there is absolute certainty about their future and commitment to the band, even including lyrics about "Pass around the contract, where's the dotted line at?". While we can't all relate to the specific situation they were in, we can all relate to moments of feeling lost, and other moments of clarity about ourselves and what we want. "Wasted", the closing track, is a particular favourite of mine, which is above all, a message of hope. Hope that our lives mean something, that there is a reason for what we do. But it's also balanced with the possibility that this may not be the case, so we need to make the most of the time we have. The whole album feels celebratory and optimistic in someway, tinged with moments of uncertainty and nostalgia, but is ultimately hopeful. It's not a perfect record, as there are some moments in songs that feel sticky, or lyrics that could be more poetic. Nevertheless, it's a solid album that will make you want to get up and sing and dance along, to enjoy the good times and relish youth.